Exactly 33 years to the day after Redskins legend Joe Theismann's gruesome injury during a nationally televised game, Alex Smith went down with breaks to his right fibula and tibia midway through the third quarter of Washington's 23-21 loss to the visiting Houston Texans on Sunday. LANDOVER, Md. (AP) — Alex Smith seemed to know immediately this was bad. Really, really bad. He covered his face with both hands, then a white towel, before his fractured right leg was placed in an air cast and he was carted off the field. One of his predecessors as quarterback of the Washington Redskins, Joe Theismann, was at Sunday’s game and sensed the same — all-too-familiar with what a season-ending broken leg looks and feels like. “I saw a pile of people go down, and then I saw Alex’s leg in the position it was in. And I turned away after that. It brought back vivid memories,” said Theismann, hurt when hit by Lawrence Taylor during a Redskins’ victory over the New York Giants on Nov. 18, 1985. “This date has always been a day in my life that I’ll never forget,” Theismann said in a telephone interview. Smith was in his first season with the Redskins after arriving in a trade from the Kansas City Chiefs. 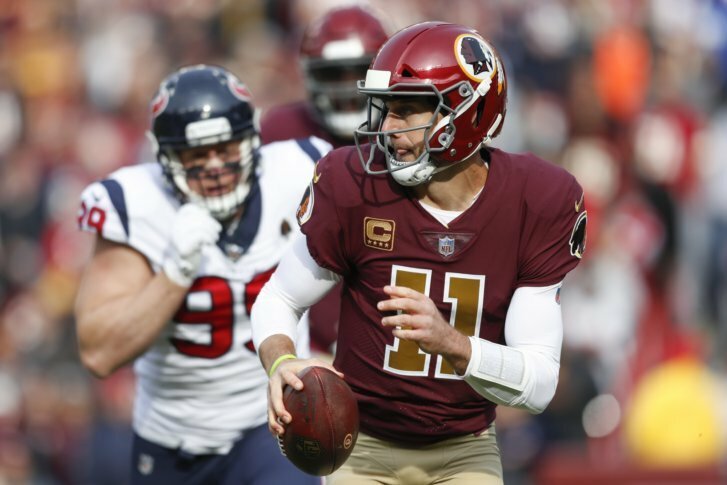 He had thrown two first-half interceptions Sunday, one returned 101 yards for a TD by Texans safety Justin Reid, as Washington fell behind 17-7. McCoy helped Washington score a pair of TDs, including on his 9-yard touchdown pass to tight end Jordan Reed on the backup QB’s first pass in a regular-season game since 2015. Now Gruden will have a short week to help McCoy make his first NFL start since 2014: Washington (6-4) plays at Dallas (5-5) on Thanksgiving Day with first place in the NFC East on the line. “I’ve still got to knock a little rust off,” said McCoy, who went 6 for 12 for 54 yards passing and ran five times for 35 yards after replacing Smith. McCoy tried to lead the Redskins to the go-ahead points, but their last drive stalled, and Dustin Hopkins tried a 63-yard field goal that fell well short. The injury came when Smith was first hit by cornerback Kareem Jackson, then by defensive end J.J. Watt. Before Smith was driven off the field, players from both teams left the sidelines to offer well wishes. He waved to spectators as he was taken away. With Smith headed to injured reserve, McCoy is the only QB on Washington’s roster, so the team will need to find a backup somewhere. Gruden said he hoped to have someone signed by Monday.